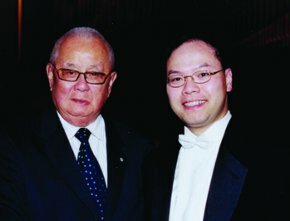 David Lam (left) with Herbert Tsang, founding music director of the David C. Lam Christian Hymn Society. David See-chai Lam passed away November 22. The 25th Lieutenant Governor of British Columbia, he was also an Officer of the Order of Canada, and a devout Christian. The following tribute was written by Lam’s friend, Vancouver lawyer Blake Bromley. A Quarter century has passed since David Lam came to Vancouver’s attention through an article by Denny Boyd in The Vancouver Sun. Before then, no one had heard of the Hong Kong immigrant; after that, David became one of the most public and cherished figures in B.C. He also became my friend. When Denny contacted David about the column, he had great difficulty persuading David to go to lunch with him. David went because I convinced him that it was important to demonstrate that Chinese immigrants donated to charity. My arguments in favour of meeting with Denny focused on the good which could come from publicizing the generosity of a recent immigrant from Hong Kong. David agreed to go in order to gain a platform to encourage other Chinese immigrants to use a portion of their wealth for charity. David’s philanthropy affected the organizations he gave to, and also the city as a whole. His million dollar gift to Regent College became a watershed in Vancouver philanthropy. And there was resentment back then — not untinged by racism — in certain establishment circles, toward this unknown immigrant who had quietly raised the threshold of the “large gift” to $1 million dollars. But David persevered. He understood the strategic potential of philanthropy. His public giving was directed to projects and institutions that worked to bring harmony and social progress to the communities in which he lived. David never made any significant gifts without his wife Dorothy’s consent. She frequently reminded him of the importance of giving to needs in their own community. When they did make large gifts to causes and charities in the Chinese and Christian communities — which was often — they didn’t publicize them because the Lams believed such publicity would promote themselves rather than the best interests of the charity. Because of the size and frequency of their gifts, the press attributed far more wealth to David and Dorothy than they ever had. They gave out of a deeply Christian concept of stewardship and a disciplined commitment to help others. And they gave because, even though they did amass considerable wealth, they never forgot their memories of having almost nothing. The year after the 1966 riots in Hong Kong, they left everything behind and emigrated to Vancouver. With the mindset of an immigrant who knew what it was to begin a new life in a foreign country with no finances, Dorothy kept a small amount of gold in order to be prepared for that contingency. The first time the Lams came to our house for dinner after he became lieutenant governor, he promised to have his driver take my children (aged 8, 10 and 12) for a joyride in his official limousine. Then he remembered that the car could not fly the lieutenant governor’s flag unless he was actually in it. Consequently, he piled in with my excited kids, and they went cruising the neighbourhood, looking for friends my kids could impress by being seen with the lieutenant governor. David, like Dorothy, will be missed. The family has asked that flowers not be sent to his memorial. But for me, remembering David without flowers is impossible. Some needy persons are going to get bouquets of flowers in his memory, so they can share some of the joy, solace and inspiration that David invariably found in flowers.